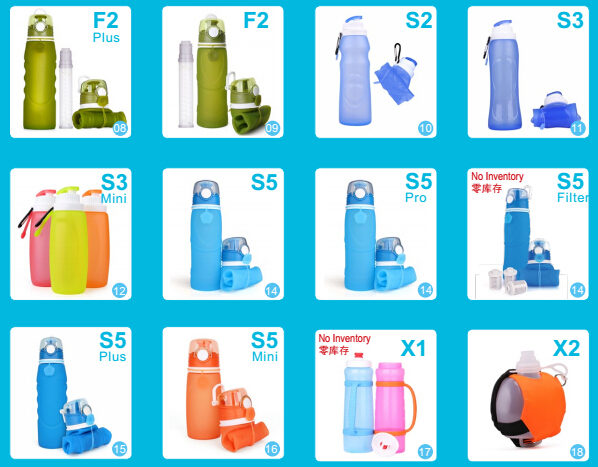 Product categories of Filter Silicone Water Bottles, we are specialized manufacturers from China, Filter Silicone Water Bottles, Reusable Water Bottles suppliers/factory, wholesale high-quality products of Camping Water Bottles R & D and manufacturing, we have the perfect after-sales service and technical support. Look forward to your cooperation! launched our micron aperture & Activated carbon filter silicone water bottle. 1．The bottle body is collapsible and easy carry on. chemical element in it. Reusable and detachable. 3．It could filtered 99.99% bacteria(Coliform) and Protozoa(Giardia, cryptosporidium, etc). 4．It could lower the turbidity of the water, adsorb the bad odor in the water. The tastes will be quite good after filtered by our filter. 5．Maximum 1000 litre of water could be filter by our filter system if the water is NOT very muddy. 6．The filter system only could filter the water that is polluted by natural biological bacteria. Do not drink the water if the water is polluted by chemicals. that can provide you one stop solution for our order, please contact our sales to start this happy journey.